Each line is allotted 10GB of high-speed 4G LTE data, on top of unlimited texts and unlimited minutes. For pricing, it works pretty simple. You have the first two lines, priced at $50 each. To add another line, it’s $20. The fourth line you add is free, bringing your total to four lines with 10GB of data each for just $120. Of course, this does not include any device installment plans you have, taxes and regulatory fees, etc. As an added benefit, do note that each line comes with Data Stash, unlimited music streaming from select services, and zero cost for data overages. 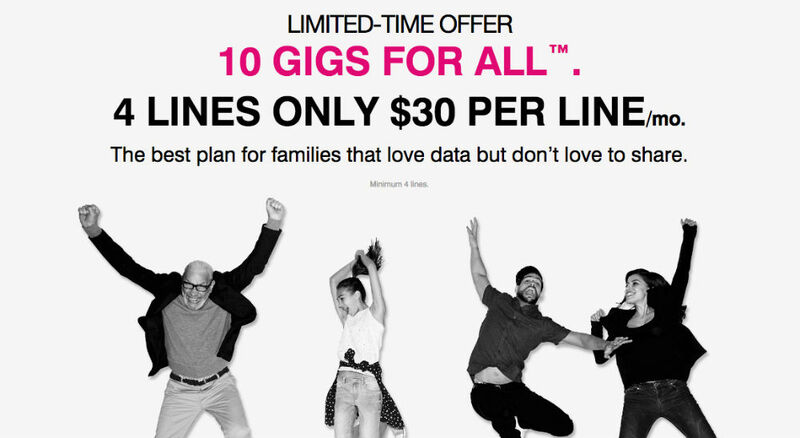 According to T-Mobile’s website, this offer won’t last long, so those who want to sign up should call T-Mobile or head into their local Magenta store.